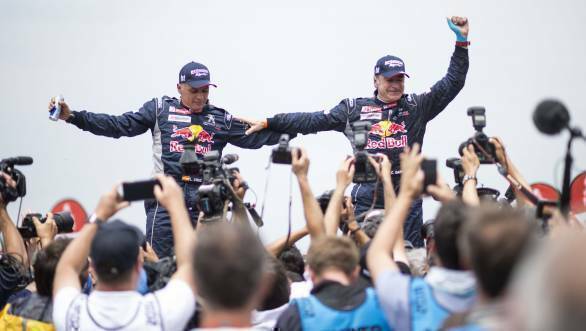 Just before the then 55-year old Carlos Sainz set off on the 2018 Dakar, he received news that his long-time co-driver and old friend, Luis Moya, had suffered a cerebral aneurysm. Moya posted a photo of himself lying in the hospital, but looking quite cheerful since he'd just been informed that there'd be no long-term consequences incurred as a result of the aneurysm. He'd signed off his tweet with "Kisses to all" and followed that up with a winking emoji. Try though he did to make sure that his friends and supporters around the world didn't go into a state of panic, Sainz, naturally was concerned. And subsequently relieved. He sent out a tweet saying that he wished Moya all the strength in the world to recover soon. He also requested that Moya, in the future, refrain from giving him such scares, particularly just before he was about to set off on an adventure as gruelling as the Dakar. It was an illustration of camaraderie. Of the close bond between driver and co-driver that exists no matter how many years have gone by since they last competed in a rally together. It's a warm and sunny Friday afternoon, when I find myself sitting in a bus that's headed in the direction of Marmaris, to the Service Park of the 2018 Rally Turkey. Someone's just mentioned Moya, which is why my thoughts first turn to him. But I daresay, I wouldn't be at a WRC event and not think of either Moya or Sainz. After all, there's only so long a body can think about rallying without recollecting Moya shouting "Trata de arrancarlo!" over and over again. Spanish for "For God's sake, start it please". Words that he'd repeated (screamed and shouted is more like it) to Sainz, begging him to start their stricken Toyota Corolla at the 1998 Rally GB. The fact that Sainz couldn't start the car meant that they lost what would have been their third World Rally Championship title. So close, yet so far, as it so often is in motorsport. A few years ago, at Rally Poland in 2014, VW had put Moya in charge of herding a flock of journalists, myself included, from one rally stage to the next. And along the way, we had the privilege of picking his brain on the sport of rallying. And I discovered that if Rally Finland is the rally of a 1,000 corners, Luis Moya is the man of a 1,000 words a second. In fact I hold him responsible for the carpal tunnel syndrome that I find myself afflicted with - transcribing that interview with Moya really did me in. Moya had told me back then that the reason he spoke as fast as he did was because of Sainz, who, he said, liked his pacenotes to be in far greater detail than other drivers did. Sainz has, over the course of his career, been accused of being far too analytical and far too cerebral. Reinhard Klein writes in his book, that beautiful WRC tome that is Rally: "Carlos Sainz's concentration never slackens. Knowledge is power, so no detail can be ignored." Which, perhaps, is the reason for those detailed pacenotes that he required. And in order for Moya to be able to deliver a whole paragraph worth of calls before the next corner, and another paragraph before the corner after that, he needed to speak as fast as Sainz drove. It was a match made in rallying heaven. There's another reason that I've been thinking about Moya and Sainz recently. Because I've been thinking rather a lot about age. A factor that decides so much in motorsport and in life itself. Age is a crucial factor in whether or not someone ought to be in the racing seat or saddle that they've managed to acquire. Or whether or not they're entitled to another racing seat or saddle that they aspire to. Sometimes people are declared too young, sometimes people are declared too old. And when you think about it in numbers, age, as a deciding factor, becomes terribly restrictive. When combined, however, with commitment, discipline, ability, results and potential, things start to make a little more sense. Well, heading into the 2018 Dakar, some believed Sainz was already past his prime. Someone who could compete in it, certainly, and might even finish the rally too. But win? Unlikely. But of all the parameters that I've listed out already, when I think of Carlos Sainz and the 2018 Dakar, it's his commitment and discipline that stand out. In addition to regular training and aerobics, Sainz underwent some fairly intense high altitude training to help him prepare for the event. He slept in a tent that simulated high altitude conditions for a whole month before the Dakar, and he also went bicycling with a mask over his face that would regulate oxygen supply to give him a feeling similar to when he'd be up in the mountain passes in Bolivia. He went on to win the 2018 Dakar Rally proving to everyone that age really was just a number. He'd put in the work that was required to counteract the effects of aging. And he'd put in every ounce of energy humanly possible to make sure that he was as good, if not better than the rest. Now, at 56, Sainz is training hard for Dakar 2019, having signed up with the X-Raid Mini team with whom he hopes to defend his title. Twenty years have gone by since Moya yelled at him, asking him to get it started again. Metaphorically, it seems like Sainz has been doing exactly that ever since. It's a little something that, I think, they call spirit.